The bridges of Basel over the Rhine. 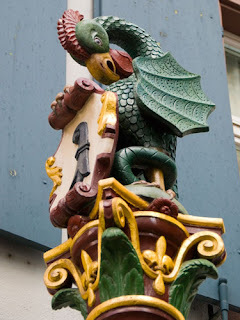 This Traveler recently found herself in Basel, Switzerland. 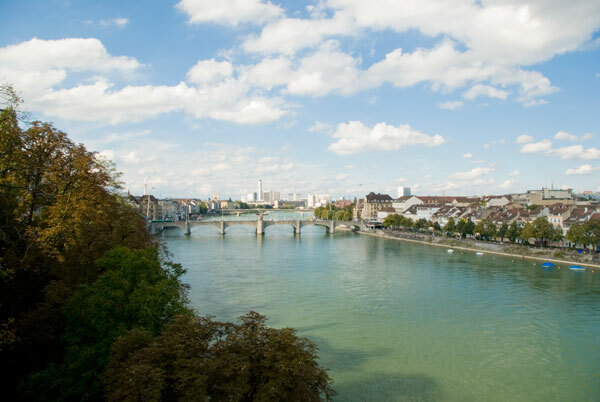 Basel sits in the northwest corner of Switzerland on the Rhine River, where the borders of France, Germany and Switzerland meet. 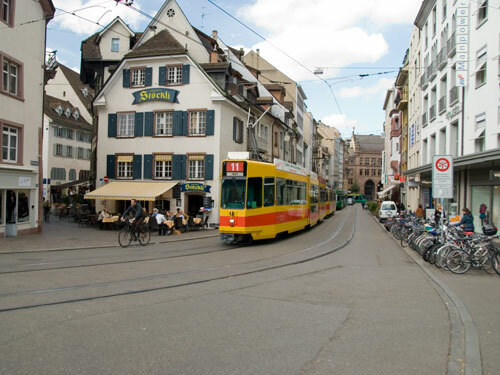 It is the second most populous city in Switzerland and is an important port and industrial center. Major settlements in the area date back to Celtic times, pre-dating Roman settlement. Augusta Raurica, located about 20 km east of Basel on the Rhine River, is the oldest know Roman settlement in the Rhine and dates back to 44 BC. 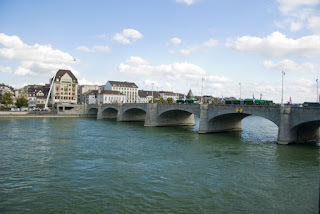 During the early Middle ages Basel was ruled by bishop-princes. 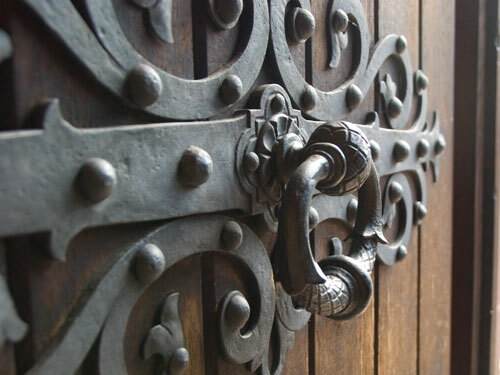 Construction of the famous Munster Cathedral began in 1019. This is my second stay in Basel. I was first here about 17 years ago on my way to Gimmelwald and Murren. I found it odd to be following my own footsteps so many years later. I had completely forgotten about the Tinguely Kinetic Fountain until I zoomed by it on the tram, sending a frisson of past and present colliding through my soul. I like Basel. I don't say that about a lot of cities. But I like it here, although photographing it at night, the city thwarted all my efforts to make it appear ghostly or disturbing, which was the atmosphere in my night photographs I was trying to capture. Instead, Basel appeared bright and vibrant, which, I suppose, says a lot about this place. Basel Marktplatz at night. 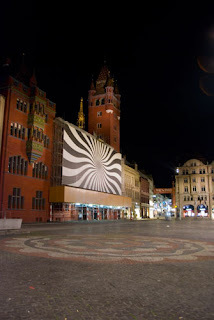 The giant op art installation covers restorations being done to the Rathaus (Town Hall). During the day, the Marktplatz is a great place to wander around and buy fresh bread, pastries, wurst, spaetzle, chocolate, and fantastic Basel coffee. 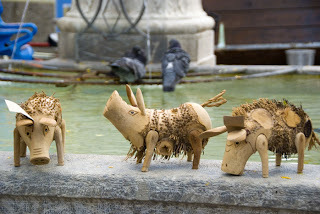 Here is a rather amusing description of Basel from McSweeney's: http://www.mcsweeneys.net/links/dolgin/rathaus.html. And of course, it being Switzerland, its a fantastic place to find chocolate! 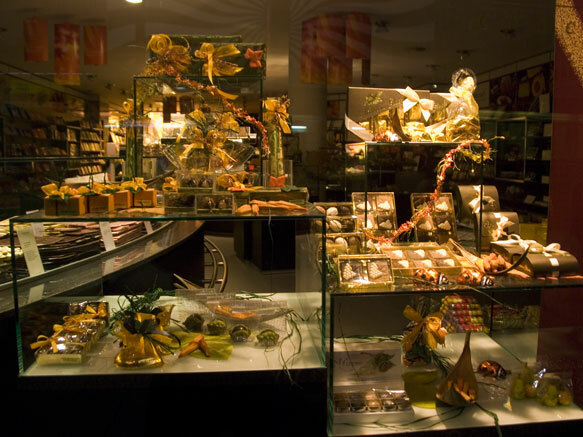 Chocolates and marzipan in a store window. Drool. 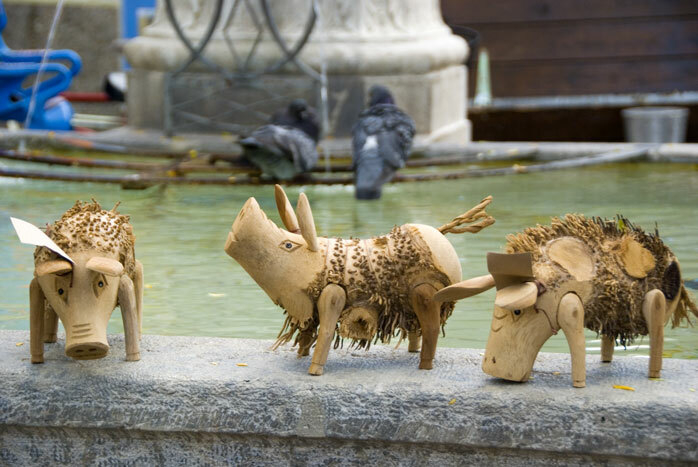 Interesting crafts for sale in Barfusserplatz. Barfusserplatz. The tram system in Basel can get you any place you want to go. Hotels give you free passes for the trams for the length of your stay. It doesn't get better than that. Barfusserplatz. 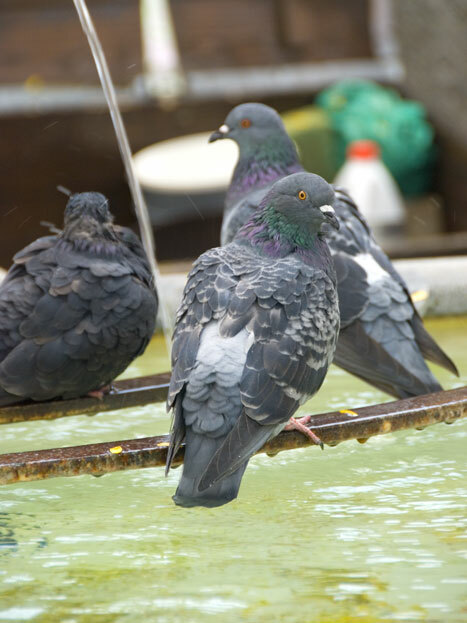 Pigeons in a fountain. Detail on the main door of Munster Cathedral. Unfortunately, this beautiful building was covered due to renovations. Click here for better photos of the building. The Basilisk is the guardian creature of Basel. I follow you on blogcatalog. 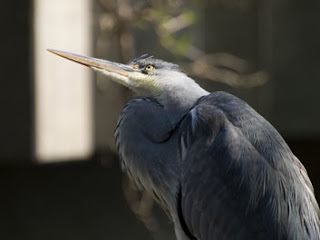 I love the pictures on your blog. Well done. Looking forward for more.